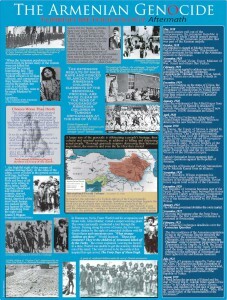 A set of five theme-oriented instructional posters that provide a visual overview of key events related to the Genocide, its prelude, methodology, and aftermath. Each illustrated poster measures 19”x 25” and includes photographs, text, graphics and a chronology, helping students grasp essential components of each theme, and providing teachers a catalyst for further instruction, exploration and study. “Prelude” provides an overview of Ottoman history from 1502 to 1913 revealing, including myths and realities. It includes a list of major historical events that led to the Armenian massacres of 1894-1896, 1909 and the Armenian Genocide of 1915. 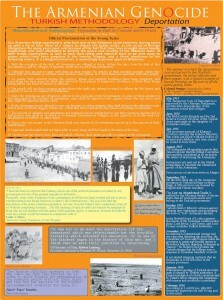 The poster includes a description of the discriminatory Ottoman taxation system and the failed treaties that sought to protect the Armenians living within the Ottoman empire against increasing abuses and usurpations. “Decapitation” describes the events from February, 1914 to May, 1915 during which Turkish leaders put in place their plan and rationalization for the Armenian Genocide. The government first set out to destroy Armenian civic leaders and intelligentsia, prompting the reaction of the Allies to warn Turkish leaders to cease these “crimes against humanity,” setting a legal precedent for a concept used in future war crimes tribunals. “Deportation” outlines the methodology used by the Turkish government to disguise the Armenian Genocide as a mass relocation program. 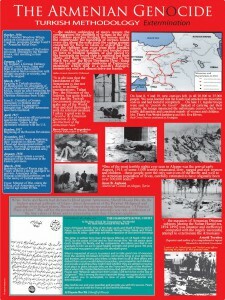 The poster includes a chronology of events from May 1915 to February 1916 showing the deportation as an effective means for destruction of the Armenians. The full U.S. State Department translation of the Official Proclamation of Deportation by the Young Turks reveals their demonization of the Armenians and strategy for the Genocide. Included are observations and statements by Swiss, German and American eyewitnesses attesting to the intent of the Turkish government to destroy the Armenians. The poster includes photographs of the deportations, deportees, and survivors. 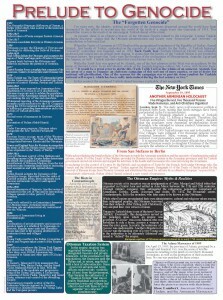 “Extermination” exhibits the extent of A chronology of monthly events from October 1916 to March 1918 with quotes by major figures from the period describing in detail the deliberate destruction of the Armenians and listing the growing reaction by public figures in the U.S. and abroad to the Genocide. Includes a map showing the deportations and massacres, photographs of the victims and refugees, many taken under threat of death. 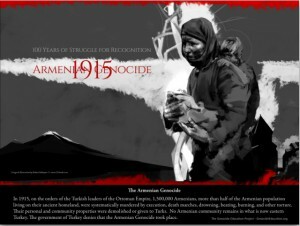 “Aftermath” illuminates the fate of the survivors, including Armenian women sold in slave markets or taken in Moslem harems, the forced Islamization of children, starvation and destitution with hundreds of thousands of refugees seeking food, and the continued destruction of Armenians in 1920 by Turkish nationalist forces. 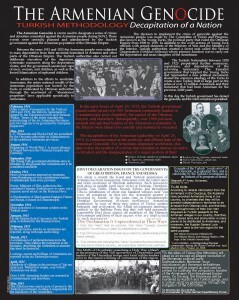 Covering the period May 1918 – July 1923, the poster also addresses the international efforts to help shelter and care for survivors, as well as diplomacy around treaties that sought to atone for the injustices committed against the Armenians, but were largely abandoned, giving impunity to the Turkish state and paving the way for the official government denial that continues today.